Lefktron is located in Stoupa 45km from Kalamata, 55km from Kalamata's airport and just 80 meters from the beautiful beach of Stoupa. 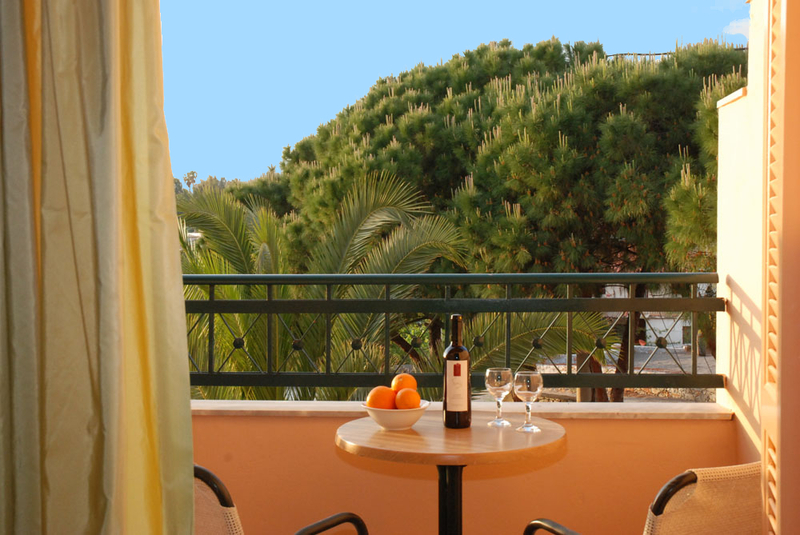 Lefktron offers 32 recently renovated rooms, all are air-conditioned with en suited WC-shower, phone, refrigerator, music and even some rooms have partly view to the sea or the hotel's garden and Taygetos mountain. Lefktron Hotel also offers swimming-pool and parking space. Start each day with buffet breakfast in the picturesque surroundings of Lefktron Hotel’s garden. Our buffet breakfast features local products and fruits. You may also visit the pool-bar for a drink. At the hotel lounge bar you may relax and have a coffe or a drink while you watch your favourite satelite tv programs or listening to music. 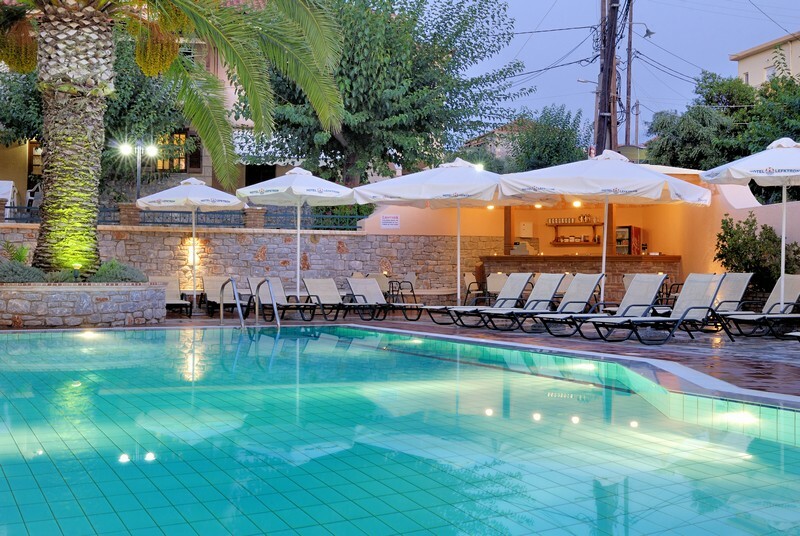 Lefktron Hotel also offers a luxurius swimming-pool and parking space. The friendly service and the comfortable facilities that are offered in relaxing surroundings will make an unforgettable holiday. • Stoupa is a seaside village located in Messinian Mani, 45 km from the city of Kalamata and 55km from the airport. An enchanting village that charms the visitors all year round, drawing them back year after year. In the summer the sea and the sandy beaches tempt all lovers of the sun and the sea. The area has two beaches, Stoupa and Kalogria. • Every evening the sunset tints the sea with the most marvellous colours – the best time of the day for the village. It is a time for taking idyllic photos, strolling on the beach or walking to the nearby picturesque village of Lefktron. • East of the village rises Beaufort castle , which was the Acropolis of the ancient city of Lefktron. According to Pausanias , the ancient Greek historian, here was a temple and the statue of goddess “Athena”. • Nikos Kazantzakis, the writer, and Alexis Zorbas one of his famous characters lived here. It is worth mentioning that Kazantzakis was exploiting the Prastova mines (1917-1918). • Messinian Mani, is a unique place of wild beauty with dominant elements, the imperious towers of Mani are of a unique architectural design while the Byzantine Churches signify the continuous historical presence of the untamed locality. • Starting from Stoupa, you can visit the small scenic villages of Mani as well as Viros and Rindomos gorges and Vasiliki forest in the Taygetos mountains . The area also offers mountaineering, walks and cycling of all grades. • Finally, it is worth while to visit Diros Caves, Mystras, Olympia, Ancient Messini, Pylos, Methoni, Koroni, Vathia and obviously, it is of interest to have a day trip to inner Mani (i.e. Mesa Mani) to the panoramic war towers with their impressive architecture. • For those visitors who love walking, nature, Greek lifestyle and relaxation, Stoupa is the ideal choice.